A Special Olympics Grand Champion ! TR: A Tremendous Confidence Builder! ETA lessons offer tremendous value! ETA is a unique NARHA, PATH Int'l., program that designs an individualized cognitive enrichment program for each client, each quarter of the year, using two to seven books that match the student's academic level. ETA also gives each student their own daily exercise program for use at home, which builds strength, flexibility, and endurance, as well as safety on their horse or pony! We believe that sequencing, gross and fine motor skills, as well as cognitive and emotional development can be enhanced by regular practice in grooming and tacking the horse. ALL lessons involve practicing these skills. 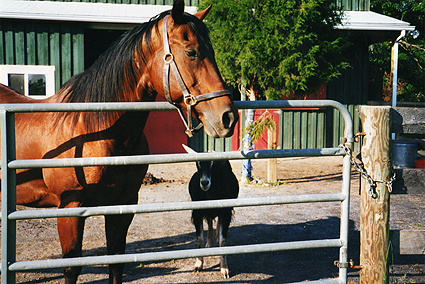 Some lessons will involve less preparation time if the horse/pony was used for another lesson immediately before, but the rider will still untack and groom the animal after the ride. 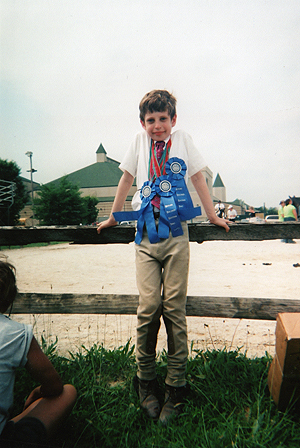 Instruction is enhanced by lessons in stable management, anatomy, horse psychology, games, take-home puzzles, work sheets, and vocabulary lists. 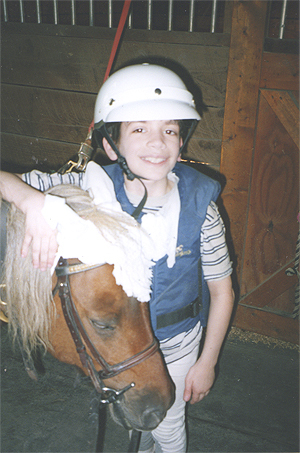 All instruction is prefaced by an individualized assessment, the signature of forms required by NARHA, PATH Int'l., release forms, an assessment by the rider’s personal physician (if he/she has mental or physical challenges), consultation with other therapists, and measurement for safety devices. Financial aid (reduced price lessons) is available. This applies to those with or without special needs. ETA also offers tailor-made specialty programs for schools, families, and or institutions of a shorter or longer duration that our regular programming, as well as classes that are more or less intensive, specially arranged with the Director. veterans of Iraq or Afganisatan. Please contact Dr. Hansen for details and to apply.